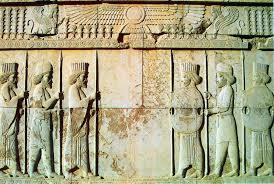 The Persian Empire was created by Cyrus II the Great between 559 and 529 BC. 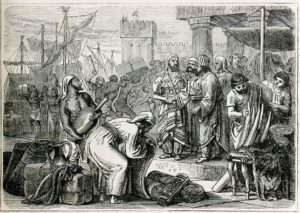 Cyrus first defeated another Iranian people called the Medes, then in 547 Cyrus defeated the kingdom of Lydia (in what is now Turkey) at the battle of Pterya and he became the ruler of most of Asia Minor. Soon afterward Cyrus also defeated the Greek cities on the Turkish coast. Rich Persians lived in palaces of timber, stone, and brick. They had comfortably upholstered furniture such as beds, couches, and chairs. Tables were overlaid with gold, silver, and ivory. The rich also owned gold and silver vessels, as well as glass vessels. They also owned tapestries and carpets. Rich people in the Persian Empire also had beautiful gardens. Interestingly, the English word ‘paradise’ comes from the Persian word for garden. On the contrary, for the ordinary people in Persia things were quite different. They lived in simple huts made from mud brick. If they were quite well off they might live in a house of several rooms arranged around a courtyard. However poor people lived in huts of just one room. Any furniture was very basic. Persian farmers grew wheat, barley, olives, and wine. They raised cattle, goats, and sheep. Hunting and fishing were also an important source of food. Rich Persians also enjoyed hunting wild animals. In order to deal with the arid climate, the Persians developed an irrigation system. They built underground canals. These irrigation tunnels were often several kilometers long. They sloped slightly so gravity moved the water. Owing to the vast size of the Persian Empire crops from one region were introduced to another. Rice and flax were introduced into Mesopotamia. Sesame was introduced into Egypt. The different races of people who lived in the ancient Persian Empire were: Babylons, the Assyrians, and the Phoenicians. For centuries Babylon was an unimportant city. It was under the leadership of the famous Hammurabi (C. 1792 BC-1750 BC) that Babylon rose to greatness. Ordinary people in Babylon lived in simple huts made from sun-dried mud bricks. However, if the owner was wealthy they might have an upper story. The rich lived in palaces with central courtyards. Walls were decorated with painted murals. There were even bathrooms with pipes for drainage. The main crops in Babylon were cereals such as barley. Pulses such as beans, lentils, and chickpeas were also important. So dated. The Babylonians also consumed cucumbers and lettuces. They kept goats, sheep, and cows for milk and cheese and leather as well as for their meat. The Babylonians also fished and caught locusts. However, as in all pre-industrial societies, meat was expensive and the poor rarely ate it. Ordinary people in Babylon drank beer but the rich drank wine. The Babylonians were polytheists in nature. They worshipped several gods and goddesses. They also believed that famine, disease, and suffering were caused by demons. People carried amulets to protect themselves from evil spirits. The Babylonians did believe in an afterlife. However, they were very pessimistic. They believed the abode of the dead was a dismal and gloomy place. 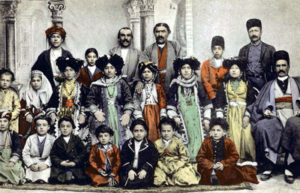 The Assyrians were warlike people from the north of the present day Iraq. From about 880 BC to 612 BC they ruled a great empire in the Middle East. Despite their cruelty, the Assyrians were also skilled artists, architects, engineers, and sculptors. Like the Egyptians upper-class Assyrians enjoyed gardens. They created large hunting parks but they also made pleasure gardens irrigated by water canals. The Assyrians planted trees such as palms and cypresses. Like the Egyptians, they planted the trees in rows, sometimes alternating species. They also created ponds and they cultivated vines and some flowers. 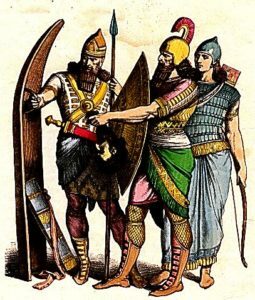 The Assyrians were superb soldiers. They were the first people to use only iron weapons, which were superior to bronze ones. They used a combination of chariots, cavalry, and infantry. Each chariot carried a crew of 3, a driver, an archer, and a shield bearer. Cavalry fought with bows and spears. Infantry fought with bows, spears, swords, and slings. The Assyrians also equipped their soldiers with sturdy boots, which helped on long marches. The Phoenicians were a people who lived in what is now Lebanon. They were a great trading people and they were at their peak between about 1200 BC and 800 BC. The Phoenicians lived on a strip of fertile land between the sea and the Lebanon Mountains. With the mountains as a natural barrier, they looked to the sea to expand. The Phoenicians are also famous for their alphabet, which they invented about 1200 BC. This alphabet was passed onto the Greeks and is the basis of the alphabet we use today. The Phoenicians were also craftsmen. They made tools and weapons from bronze and they carved ivory plaques which were used to decorate furniture. The Phoenicians were excellent sailors. They built warships with masts and sails. However, in battle, the ship would rely on its oars. The Phoenicians are believed to have invented the bireme, a ship with two rows of oars and the trireme with three rows. A man played the flute to help the oarsmen row in time. Merchant ships were broader to carry cargo. A typical Phoenician merchant ship was 30 meters long and 7 meters wide and had a crew of about 20. The Phoenicians were merchants who sailed around the Mediterranean. They also sailed past the Straits of Gibraltar and around western Africa. They may have also sailed to southwest England in search of tin. The Phoenicians exported cedar wood to Egypt. In return, they imported Egyptian and papyrus (a type of paper made from the papyrus plant which grows in the Nile). The Phoenicians also traded with the Greeks. (Their name Phoenician is derived from the Greek word for purple-red). The Phoenicians made purple dye from murex shells and they were famous for their cloth industry. The Phoenicians also exported dishes made of precious metals, jewelry, and glass vessels. They imported copper from Cyprus and tin from Turkey (the two metals were combined to make bronze). Silver and tin were imported from Spain. For centuries the Phoenicians dominated long-distance trade in the Mediterranean. 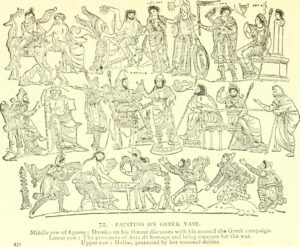 However, in time the Greeks grew to be their rivals. Alexander the Great finally ended the greatness of the Phoenicians. In 332 BC he captured Tyre and the Phoenicians were absorbed into his empire.